Ian Kenney is the Penn State Drum Major for the 2010-2011 season. He also plays in the band The Great Digression and you can listen to some tracks on their MySpace page. With all that going on as well as school, we still caught up with him for our first ever Q&A. This is Getting Old: Were you nervous the first time you did your flip in front of 100,000 fans? Ian Kenney: I wasn't as nervous about doing the first one as I was over the amount of wind there was gusting downfield when we got out there which made things considerably more difficult (the hat pretty much acts as a kite because it's very light and tall) After that first one was out the way, it just felt natural and now I find the whole experience more enjoyable than nerve-wracking, and I think the results since then show that. TiGO: What is your most memorable Penn State game? Ian: That absolutely has to be the 2008 Michigan St game, when mother nature provided a whiteout of it's own when we took the field for pregame. At the time I was a sousaphone player and as we held on the field to honor our seniors before the Floating Lions, the 2 minute break was long enough for most of our valves to literally freeze in place, so most of us couldn't play any notes except the ones that worked with however which way our valves froze. Oh, and clinching the Rose Bowl berth was pretty pretty awesome too. TiGO: What is your most disappointing Penn State game? Ian: Before Homecoming vs. Illinois this year, it was a tie between '08 Iowa and the Rose Bowl, but I felt that game was the tipping point for this season. I'm really crossing my fingers for two more wins, we have such a strong band this year that it would be a shame if we didn't get to travel somewhere for a bowl game. TiGO: What is your prediction for the Men's Basketball team this season? Ian: I think it depends on how well Battle/Buie connect on the court and if we can play smart defensively. I think there's a lack of experience in the front court and missing Sasa Borovnjak will obviously hurt things some. With that said, I think a 20 win season isn't out of the question... but a lot of things need to happen. TiGO: Who is your all-time favorite PSU player? Ian: I Consider myself a late-bloomer as a PSU fan (didn't follow the sports much until I got here). I'd say Derrick Williams. I was always most excited for the kickoff/punt returns. I would like to thank Ian for taking the time to answer a few questions. 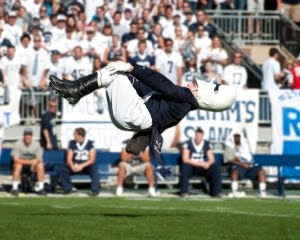 To find out even more about him, check out his web page as well as the Penn State Blue Band. You can also follow him on Twitter.